A couple of pages later in Chronogram, what appears to be a lovely little cocktail made with a pine shrub and bitters: The Evergreen. Since there is no citrus in the area, we thought it would be a great idea to harvest young spruce tips, when they are highest in Vitamin C.
The word “Scofflaw” has come to mean “A person who flouts the law, especially an unsustainable one.” But such was not always the case. It was in 1923, when Delcevare King, a member of the Anti-Saloon League, posed a contest to create a new word in order to combat the continued drinking which was going on during American Prohibition. The new word was to be one “which best expresses the idea of a lawless drinker, menace, scoffer, bad citizen, or whatnot, with the biting power of ‘scab’ or ‘slacker. '” The $200 prize elicited a huge response. On January 16th, 1924, the Boston Herald announced the winning word as “scofflaw”, with the winnings shared by the two Boston area residents, Henry Irving Dale and Kate L. Butler, who both submitted it. This was not the end of the story however, in just a little over a week, a salvo was launched from Harry’s New York Bar in Paris, where they created a new drink and christened it the “Scofflaw”. I have three recipes. One is from Ted Haigh by way of Imbibe Magazine. Combine with ice and shake. Strain into a chilled glass and garnish with a twist of lemon. One is from Robert Hess. Mr. Hess notes that he has a recipe in a book by the owner of Harry’s New York Bar in Paris, where the drink originated. That recipe is also the one printed at CocktailDB, as follows. A fourth arrived today from Gary Regan. Try them all in celebration of Repeal Day. But more importantly, can we make it at home? Once one finds Jeffrey Morgenthaler’s recipe for grenadine, one can. Heat juice slightly, just enough to allow other ingredients to dissolve easily. Stir in remaining ingredients, allow to cool, and bottle. Yields two cups. But I’m missing a couple of ingredients. Luckily, around the time I was looking for pomegranate molasses, I saw Alton Brown’s Good Eats episode on the pomegranate, and he covered the topic. Dissolve sugar in pomegranate juice and lemon juice over medium heat. Once the sugar dissolves, simmer over medium-low heat until reduced by 3/4, or the consistency of a thick syrup. Remove from heat and cool. Yields four to six ounces. Dissolve the sugar in the pomegranate juice over low heat. Add molasses and vanilla; stir to combine. DO NOT BOIL. Remove from heat and bottle. Yields two cups. The hot days of Summer call for a cool drink, shade, and a lazy breeze through the apple trees. If my taste memory serves, this is Grandmother’s Lemonade. Cover the bottom of a half-gallon glass Tropicana Orange Juice bottle with sugar. Squeeze lemons until the sugar is covered and begins to melt. Stir to dissolve the sugar. Add water and ice to fill the remainder, about two quarts. Margarita, Won’t You Come to My Party? For those interested in the recipe for the gallon of Margaritas which was consumed at my party yesterday, I used Jeffrey Morgenthaler’s recipe from A Gallon of Margaritas by the Gallon. Below are the details on which tequila and triple sec were involved in this concoction. Pour each ingredient in a gallon jug, then shake and refrigerate. To serve, wet the glass then roll in salt so that the outside rim is coated, then pour the Margarita over ice. A dram of spirituous liquor that has mint steeped in it, taken by Virginians of a morning. The Mint Julep is rumored to have led to as many arguments over the nature of the drink as the Martini, if not more since it’s a Southern invention and we’re pugnacious folk. Also like the Martini, some recipes abandon the pretense that there’s more than spirit in the drink, most notably the following by Henry Watterson. Pluck the mint gently from its bed, just as the dew of the evening is about to form upon it. Select the choicer sprigs only, but do not rinse them. Prepare the simple syrup and measure out a half-tumbler of whiskey. Pour the whiskey into a well-frosted silver cup, throw the other ingredients away and drink the whiskey. Mr. Watterson’s recipe is humorous, much like the humor in glancing at the vermouth while pouring the gin, but the ceremony obvious in the first part of the recipe is typical. Eric Felten tells an amusing account of Roosevelt v. Newett which serves to highlight that a julep is more than just the Mint Julep. It’s a whole class of drinks. Whereas a cocktail in simple form is any spirit, sugar, water, and bitters, the julep is any spirit, sugar, crushed or shaved ice, and lots of garnish. And sometimes without the spirit: It started in Persia as rose water, جلاب, then slowly evolved into a medicinal concoction in Europe, and on to something worth drinking in America. The recipes compiled at Webtender offer a nice sample of juleps, as does CocktailDB. What distinguishes a julep from a smash? Quantity. Details are to be found in Jerry Thomas’s How to Mix Drinks, David Wondrich’s Imbibe!, and a couple of tomes dedicated entirely to the Mint Julep. You’ll want to watch Chris McMillian hold forth. 2 oz. fine bourbon. All right, maybe 4 oz. It’s a hot day. Adjust the size of your glass as necessary. Build, with the care you used in holding your first child. Gently, ever so gently, pluck 12 or so leaves from freshly cut sprigs of mint, and place in the bottom of your glass. Add one bar spoon of fine sugar and a splash of water. Press together gently — you’re not making a mojito — enough to dissolve the sugar in the water and distribute the mint oils around the glass. Crush some ice. No, that’s not enough. Crush some more. Now crush it again. The bourbon will be cradled in this finely crushed ice. Place a spoon in your glass, then pile the ice on top of the mint and sugar, leaving about a half inch free. Pour the bourbon over the ice and stir gently. A frost will form on the outside of the glass. Remove the spoon and add more ice. Slap a sprig of mint between your hands and add to the glass as garnish. First you should know that I am not from Bermuda. And while I once visited on a cruise, I drank only beer while I was there, so have no first-hand confirmation that the Dark and Stormy is, in fact, Bermuda‘s national drink. Second, I now associate this drink with Spring because of Jeffrey Morganthaler’s post on the subject. Third, I make it backwards, pouring in the rum after the ginger beer. Now it does look like storm clouds on the horizon. Squeeze of a lime wedge. On second thought, make that 1/4 to 1/2 oz. fresh lime juice, to taste. Oh Hell, just garnish the damn thing with a huge wedge and let the drinker decide. 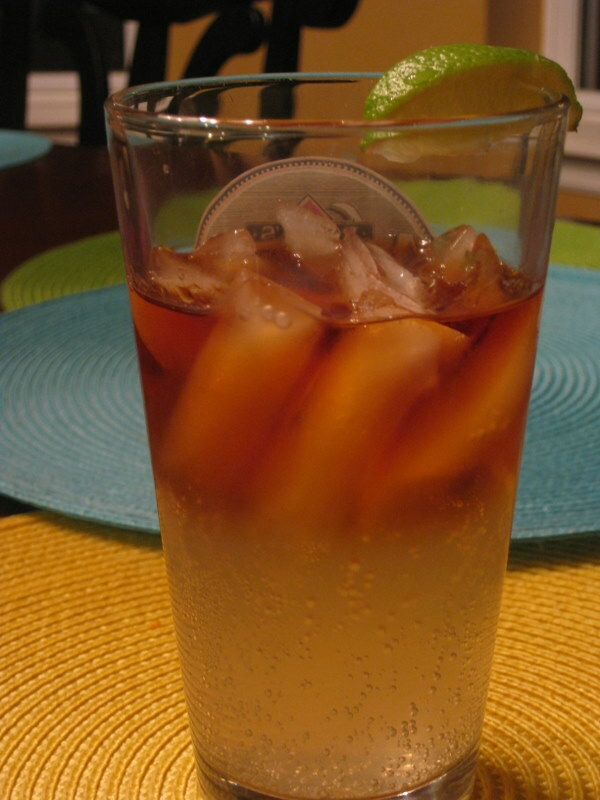 Build in a highball glass, ice, ginger beer, Gosling’s Black Seal Rum, and a squeeze of lime. Garnish with a lime wedge. Allow the recipient to stir if they so desire. I also need to get some highball glasses. Until Firefox gets the hang of tracking paths through the browser history, I can’t quite say exactly who started this idea in motion, but I can say what did: an article on using one’s discarded Christmas tree in various dishes, which crossed my transom around about the same time as Imbibe Magazine‘s 2010 Christmas card, which features a cocktail called Walk in the Woods containing Zirbenz, a Swiss liqueur made from the fruit of the Arolla Stone Pine. I doubted that anyone else in the house would like to have their lunch garnished with fir, so why not use it to make a drink? After removing the Douglas Fir from the house, I dismembered it to simplify handling, then moved it to the garage. It was a fairly warm day, as far as the days this January went, but I’d rather not work in a foot or more of snow. There it sat until this past Monday. I then removed some of the more fragrant needles from the branches and washed them. Yesterday I put a handful or so in a 16 oz. Mason jar. This covered the bottom of the jar to about a 2 inch depth. I then added Tito’s Handmade Vodka up to the 12 oz. mark, put the top on, and let it sit for 24 hours. The result was strained through cheese cloth into an empty Tuthilltown whiskey bottle. Some experimentation might be needed to determine the optimal infusion time: the result is bitter. And it smells just like the tree. It’s too bitter to drink straight, so what’s to be done? A cocktail! Combine ingredients in a shaker with ice. Shake until cold, then strain into your favorite glass. Serve straight up, without garnish. I was experimenting as I built this, so the first version was built in an old-fashioned glass, and only shaken to chill. Dissolve the sugar in the vodka infusion, then add rum and lime. Add ice to your shaker, then the liquids, and shake until cold. You might want to sweeten to taste. To make Irish Usquebaugh; from Lord Capell‘s Receipt, when he was Lord Lieutenant of Ireland. To every Gallon of French-Brandy, put one Ounce of Liquorice sliced, one Ounce of sweet Fennel-Seeds, one Ounce of Anniseeds, one Pound of Raisins of the Sun split and stoned, a quarter of a Pound of Figs split, two Drachms of Coriander-Seeds, let these infuse about eight or nine Days, and pour the Liquor clear off, then add half an Ounce of Saffron, in a Bag, for a Day or two, and when that is out, put in a Drachm of Musk. If when this Composition is made, it seems to be too high a Cordial for the Stomach, put to it more Brandy, till you reduce it to the Temper you like. This is the same Receipt King William had when he was in Ireland. The recipe above is from The Country Housewife and Lady’s Director in the Management of a House, and the Delights and Profits of a Farm, by Richard Bradley (1736). I was looking for usquebaugh and ran across this recipe at A Collection of Civil War Alcoholic Drink Recipes at Civil War Interactive, which kindly noted the source was The Country Housewife and Lady’s Director, as reprinted in A Sip Through Time by Cindy Renfrow. I cannot attest to the quality of the recipe, but King William can. You may notice that this concoction bears no relationship to a fine glass of Tullamore Dew other than that both contain alcohol. It’s a cordial, a medicinal water, the cure for what ails you. Happy 3rd Birthday, No. 2 Son! Soon we’ll have the family over for a party in your honor, and they’ll be drinking some stuff you can’t, yet. It must be my upbringing, but when I think of the Bloody Mary, I don’t think of the drink: I think of South Pacific. So, what shall we have? Shall it be the recipe from Harry’s New York Bar in Paris? The one given by Ernest Hemingway? Some fancy concoction from the Employees Only cookbook? Or a variation using their common base: vodka, tomato, and citrus? The name is intentionally misspelled because I seem to be unable to type two O’s in a row. In the jargon of my trade, it’s a Blod^Hody Mary. Last night I dreamt that my grandfather on my mother’s side was about to reveal his secret recipe for a Bloody Mary, and then I woke. It would be a secret because, as far as I know, he did not drink. The recipe that follows is closer to Hemingway’s than to his. Chill a pitcher, then fill halfway full with ice. Cut two whole tomatoes into large pieces, then puree. This should make approximately a pint of tomato juice. Add to the pitcher. Add one pint of vodka. Stir. Add 1 3/4 oz. lemon juice. Stir. Add 1 tablespoon of Worchestershire sauce. Stir. Add 1/2 tsp. cayenne pepper. Stir. Add 1/2 tsp. salt. Stir. Grind fresh pepper over the pitcher, about five turns of the grinder. Stir. Wait for your guests. Serve in a rocks glass, or a highball if you have it. Garnish with fresh pepper and a lemon wedge. Now that I have more than two bitters in the house, let us try something. A cocktail is spirits of any kind, sugar, water, and bitters. How about an Old-Fashioned with gin? Build in an old-fashioned glass. Soak the sugar cube with the bitters and muddle with water. Add a cube of ice or two, then the gin. Stir and enjoy. What Fashion of Gimlet Might This Be? Having acquired an essential ingredient in the Deadrise, I find myself without another: the cucumber. Well, there’s nothing to it then but to make the necessary sacrifice and drink the result anyway. In the back of Speakeasy (Ten Speed Press, 2010) there is a recipe for lime cordial. As I also do not have Kaffir lime leaves, this prompted the substitution given below. In a mixing glass, stir well to combine the lime juice and agave syrup. Add the gin and bitters, then shake with ice. Strain into a cocktail glass. We typically host Christmas Day dinner at our house, after my brother-in-law and his wife host the Feast of the Seven Fishes at his. Christmas Day is a more subdued affair, with fewer guests, and more flexibility in the menu. This year we had turkey, and this year I thought I’d serve a punch. Finding a punch recipe was harder than I thought it would be. There are so many options, and so many of the options require liqueurs and other ingredients that I don’t yet have in my cabinet. Some I considered were Philadelphia Fish House Punch, Garrick Club Punch, Planter’s Punch, Chatham Artillery Punch, and those in this month’s issue of Imbibe Magazine. I settled on this Harvest Punch from Mutineer Magazine. The picture is pretty. The spirits in the recipe are the fine products of Philadelphia Distilling: Bluecoat Gin and Vieux Carré Absinthe Supérieure. Unfortunately, none of the shops around sells Vieux Carré, and the absinthe varieties they do have seem to insist on using artificial food colorings. I should have decided earlier; I could have ordered by mail. Fortunately, a nearby shop does sell Bluecoat Gin. As a result of the lack of absinthe I substituted Romana Sambuca. The punch lost, I’m sure, some complexity, but I wouldn’t know: I’ve not had absinthe. I also left out the cranberry bitters. I’ve reduced this to serve the eight adults at our Christmas dinner, and still had a quart left over. This recipe can be prepared in the punch bowl or in a mixing bowl beforehand. I used a mixing bowl. I did find that the cranberry in the punch is quite strong, and mellows substantially if it rests overnight. Freeze a thin layer of water and cranberries in a bundt pan, filling about a quarter of the pan. Toast the cardamom pods and star anise over a medium flame. While waiting for them to toast, squeeze the lemons. In a larger mixing bowl, mix the confectioner’s sugar with the lemon juice until dissolved. Add the gin and sambuca, mix until thoroughly combined with the lemon juice and sugar, then add the remaining ingredients, save the sparkling water and the garnish. Stir well. At this point you may wish to sample the punch to see if needs adjustment. Bear in mind that the punch will be diluted later by sparkling water and ice. I increased the apple cider ration from 16 oz. to 20 oz. to cut the bitterness of the cranberries. Combine with sparkling water over ice in a punch bowl. Garnish with cranberries, orange wheels, and mint. Mr. Boston’s Official Bartender’s and Party Guide (64th Edition) (Warner Books, 1994) has this to say on the subject of egg nog. Eggnog can be made from scratch, but since those recipes use raw eggs, which may carry the risk of salmonella poisoning, only recipes using commercially prepared eggnog are included here. And so they have a whole section containing recipes which basically consist of “add [spirit] to any old egg nog you find in the store.” The current edition is somewhat better. I like egg nog, but I find the commercial preparations to be far too thick and sweet for my taste these days. Besides there’s no fun in buying a quart of something and tossing some rum in it. This year, I’ll make my own. There are two recipes that I’ve had my eye on. One, Bourbon Eggnog from Imbibe Magazine, I haven’t made yet. The other, Jeffrey Morgenthaler’s Egg Nog, I made tonight. While this is the very first egg nog I’ve made from scratch, it’s also the best egg nog I’ve ever tasted. Combine the half and half, brandy, rum, and nutmeg in a measuring glass. Beat the egg in a blender for one minute. Let the blender continue to run, and slowly add sugar. Wait a minute. Add the contents of the measuring glass and blend until combined. Set in the refrigerator to chill and to let the flavors combine. Serve in a coupe, a punch cup, or a old fashioned glass as suits the occasion. Garnish with grated nutmeg. The glass will determine, to an extent, the serving size. If you’re bad at multiplication, you can also find this recipe in The New York Times, either on-line or in The Essential New York Times Cookbook, as Blender Eggnog. Is it a coincidence that on the heels of one of the worst economic crises since The Depression, artisan cocktails began making a huge comeback? Actually, no, it’s not. It’s typical. [L]iquor consumption and drug use peaked when real incomes were falling rapidly, prices were surging and unemployment was increasing. A comparable surge in drinking (to the highest recorded levels in American history) occurred in similar circumstances during the climactic years of the eighteenth century price revolution. A long decline in alcohol consumption coincided with the Victorian equilibrium. The Bureau of Labor Statistics publishes data on expenditures on alcoholic beverages, and the Centers for Disease Control do the same for alcohol consumption. Historical data on alcohol consumption is a little harder to locate at the CDC than it is at the OECD. Both data sets lag by a few years. Expenditures and consumption are not the same things, since price per unit of alcohol varies. Strangely, expenditures are falling, and have been. Consumption in the United States was decreasing from 1983 to 2000, but since 2001 is back on the increase. Since I’ve not noticed the prices dropping, purchasers are likely shifting consumption to cheaper products without reducing overall consumption. This could be either a switch from Dogfish Head to Budweiser, which I doubt, or from beer to distilled liquor, and, thus, cocktails. The Martini that most folks know, if they order a Martini in a bar, is between six and nine ounces of chilled vodka or gin, perhaps with the glass washed with vermouth. (Great! Three drinks for the price of one!) And depending on the vermouth being used this is perhaps a reasonable caution. However, it’s not a classic Martini: it’s a glass of [insert spirit here]. A lot of mixing drinks is taste, often opinionated taste. This is fine. One can even be snooty about it if one wants. I’ve found that each of the Martini variations I’ve tried has its own taste, some better than others, and its own rewards, such that the proportion I mix tends toward my preference of the moment. Tonight, to go with the Italian Wedding Soup my wife made, I stirred up a Sweet Martini, using Tanqueray London Dry Gin, Martini & Rossi Rosso, and Angostura Bitters. Stir in a mixing glass and strain in to a cocktail glass. Garnish with a cherry. The proportion here is 2:1 gin to vermouth. This is slightly less gin than called for in the CocktailDB recipe, but if one uses their scaling tool to adjust from a 4.5 oz. glass to a 4 oz. glass, one arrives at this ratio. I have a 4 oz. glass, but wasn’t considering that; I just like the taste at 2:1. Robert Hess, in the video below, uses 3:1. That’s also fine, if one prefers. Over the summer Legal Sea Foods offered a cocktail they call the Deadrise. Huh? What’s a deadrise? A fishy kind of zombie? Nope. The deadrise is the angle between the bottom of a vessel and the horizontal in the transverse plane. The deadrise is also a kind of a boat used in the Chesapeake. Legal Sea Foods’ Deadrise looks like this, and contains Belvedere vodka, cucumber, lime, and grapefruit bitters. They were quite willing to make a sample, which was tasty, but I asked that they substitute Hendrick’s Gin for the vodka. Hmm, I thought, this is definitely a drink I want to make at home. But what’s the recipe? I suppose one could experiment, but not I. No, experimentation is for those without elite research skills. Someone, somewhere, had published this recipe, and I would find it. Someone had: Blast Magazine, in their article “Six Light Drinks to Sip on This Summer” (July 20, 2010). Something about this recipe is not quite right, given these remarks about, and this interview with, their cocktail program manager, Patrick Sullivan. One wonders if it was altered for wider consumption; one must buy Fee’s grapefruit bitters and find out. Muddle cucumbers, lime cordial and salt in a mixing glass. Add vodka, bitters and ice. Top with a metal tin shaker and shake hard; strain into a martini glass. Made today, the following were muddled, shaken, and strained as above. Now that’s a remarkably close approximation of the drink I had at Legal’s. Girlfriend, I present for your classy enjoyment the Cosmopolitan. Or, rather, a variation thereof since I don’t stock citrus vodka. Shake well, and strain into a chilled cocktail glass. Garnish with flair. This recipe differs quite a bit both from the self-styled Perfect Cosmopolitan and the Cosmopolitan mixed by Robert Hess (video below). It’s derived from the recipe at the CocktailDB, which is from The Joy of Mixology, by Gary Regan. Why? Because I happened to read it first. About the cranberry juice, I did not use Ocean Spray cranberry juice cocktail. It’s sweetened, and I’m not much for the sweeteners. One might use instead the juice from those fresh cranberries just bought to make cranberry sauce for Thanksgiving. I used a store-bought 100% cranberry juice: Nature’s Promise Cranberry juice from Stop & Shop.